Spring may just be the perfect time to visit Eastern Europe. The landscape is spectacularly lush, tourists are few and far between, and consistent temperatures in the mid 20’s are a welcome relief from a long Canadian winter. 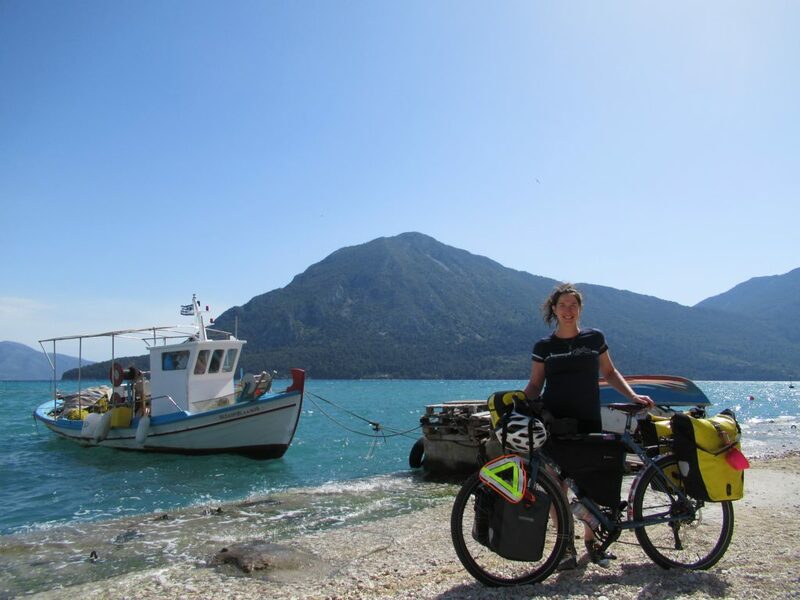 My partner Heather and I packed up our touring bicycles and gear for a self-supported cycling trip through the Balkans in April. With just over a month to make our way from Athens to Split, our plan is to have enough time to take the scenic route. 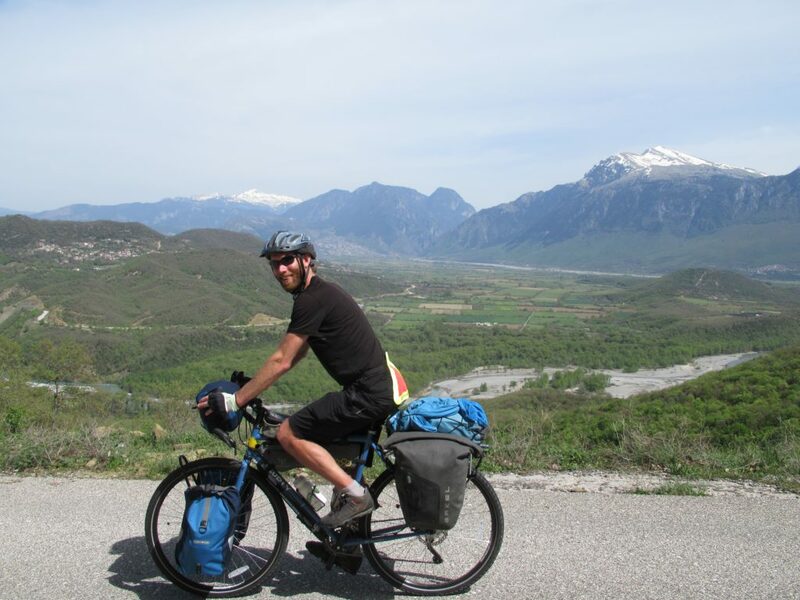 With no itinerary, our first choice was likely our biggest; do we go big out of the gates (with a 1500 metre climb and over 7% grades) in the interior of Greece, or head for the sunny Mediterranean and its more manageable climbs? We felt the weight of our fully loaded bicycles. And considered that our ski season legs hadn’t pushed the pedals in months. And thought more about that soul-crashing grade. Sanity prevailed and we headed west for the coast. A short train ride outside of the sprawling city of Athens and we were off, headed north for Albania. We hugged the road along the Gulf of Corinth to Patras, then bent northwest to quiet roads overlooking the Ionian Islands. No wonder tourists flock here in droves in the summer – the scenery is spectacular. But early April meant that we had the roads to ourselves more often than not. Highlights included the quiet seaside town of Astakos, the charming fishing village of Mitikas, and the surprisingly scenic town of Vonitsa on the Ambracian Gulf east of Preveza. Most of the road along this portion of southwestern Greece was beautiful and lightly trafficked. We continued north toward the bustling port city of Igoumenitas on a mix of busier and quieter roads, and spent the evening a dozen kilometres away on the outskirts of Plataria, watching the fiery sun set over Corfu. Apparently the lone overnighters in the sprawling seaside campground, we woke to find ourselves locked in, a not so early season perk. 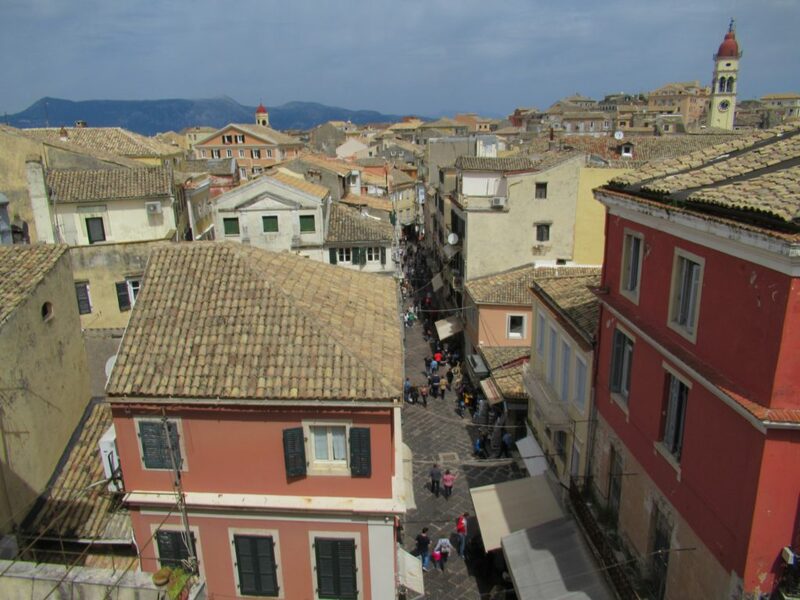 Having heard good things about Corfu, we hopped on a ferry and leisurely cycled our way to the island’s namesake town for what felt like a vacation compared to the rest of our travels. The combination of Greek Easter and pre-summer meant that the southern half of the island felt like a ghost town. Just about everything was closed, save for a boisterous family-owned restaurant that invited us to share in their traditional celebrations. Egg cracking contests, dancing, pig roasts and generous beverages…the Greeks have it figured out. Our good fortune continued in Corfu. Eager for a coffee, we stumbled upon Puppet, a cozy Parisian-like café in the heart of the city, and couldn’t believe our luck to score a room in their new guesthouse opening the following week. A shared passion for bicycles between Puppet’s owner and us was our ticket in to a place oozing with character and thoughtful touches including curated music and local delicacies. We explored the World Heritage Site downtown core on a day off, then crossed back to Igoumenitas to continue north to Albania. Faced with mountain passes no matter which route we chose, we took the advice of a passing cycle tourist and aimed inland through tiny Greek towns and a gauntlet of guard dogs. The Frenchman we spoke with insisted we visit the town of Permet. We could tell by the grin on his face it would be worth it. Part of the deal with cycle touring is taking the “good” with the “bad”. To access some of these scenic places sometimes means navigating busy cities and fending off menacing dogs on rural roads. And although the early season means that tourists have yet to arrive, finding a hotel or campground that’s open (or doesn’t lock you in) can be a struggle. 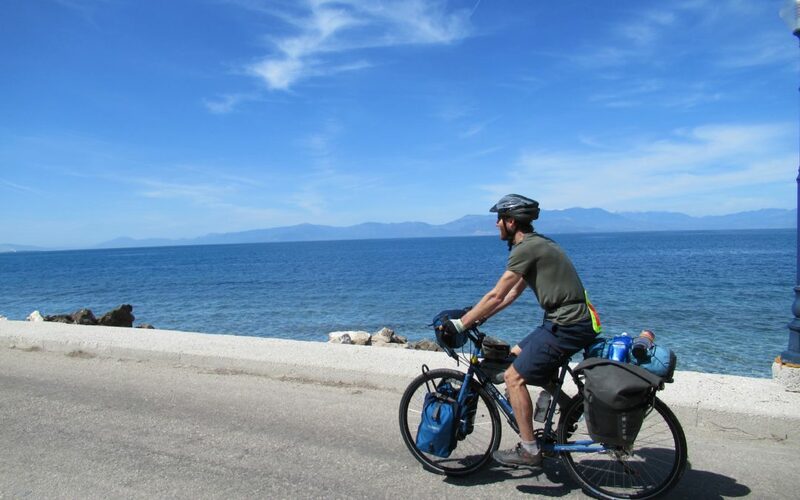 Joining an organized tour with Kootenay Cycling Adventures takes the worry out of a cycling trip. With quiet mountain towns, minimal traffic, luggage transport, and all accommodation and meals included, guests can focus on the joy of riding and know that the details are taken care of. And with consistently sunny and warm summers in the Kootenays, fjord-like vistas, and a reputation for celebrating locally grown food, you don’t have to head to the Mediterranean for a taste of the good life.